How Many Of These Statements Can You Say Yes To? If you answered YES to 2 or more, then THE PRODUCTIVITY CURE is a perfect fit for you. The Productivity Cure is an entire time-management, mindset and business growth system. Especially for independent entrepreneurs, creative business owners and experts. Less overwhelm. More flow. Way more freedom. So when taking the leap to building my online business I needed a productivity ‘cure’. I took my decades of experience and developed a new system for myself. Even whilst juggling solo-parenting and recovering from adrenal fatigue. And I did it with a big dose of wellbeing - and it's as much about mindsets as it was about to-do’s lists and goals! And that's how The Productivity Cure was born. What Will YOUR Productivity Success Story Be? Khush got clear on her vision, got focused and within months of going through The Productivity Cure had created, launched and sold out her own online course. 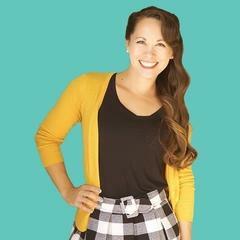 She's now earning 5-figures a month from this new course and changing the health of many more people! 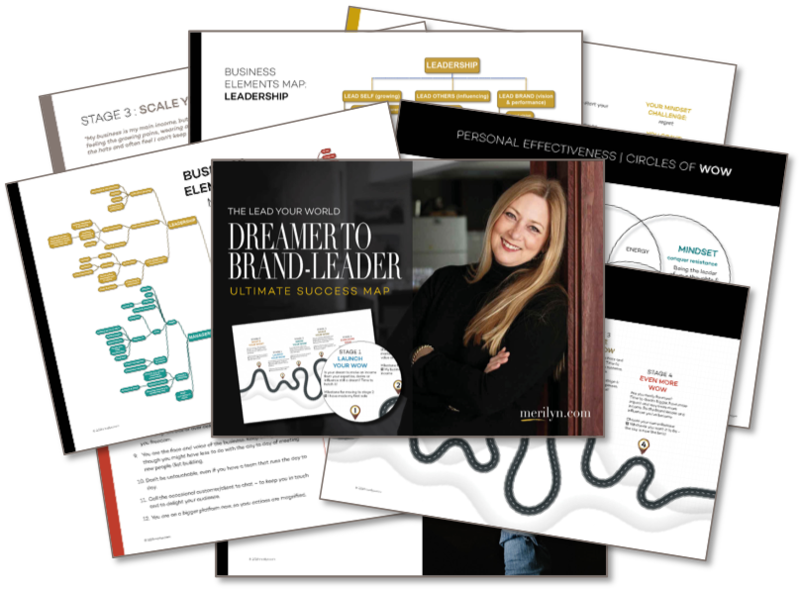 Monica got the clarity she was seeking and started her dream personal brand within weeks of doing The Productivity Cure. 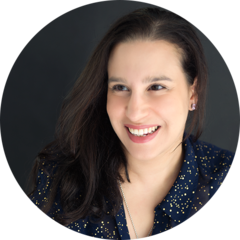 She started with zero and now has over 150 paying clients in her membership site. Plus she's a mum of 8 kids (including 2 sets of twins under 7). ☑️ Knowing exactly WHAT to do when you get those few hours to work on your dream - so you stop dorking around on the internet! 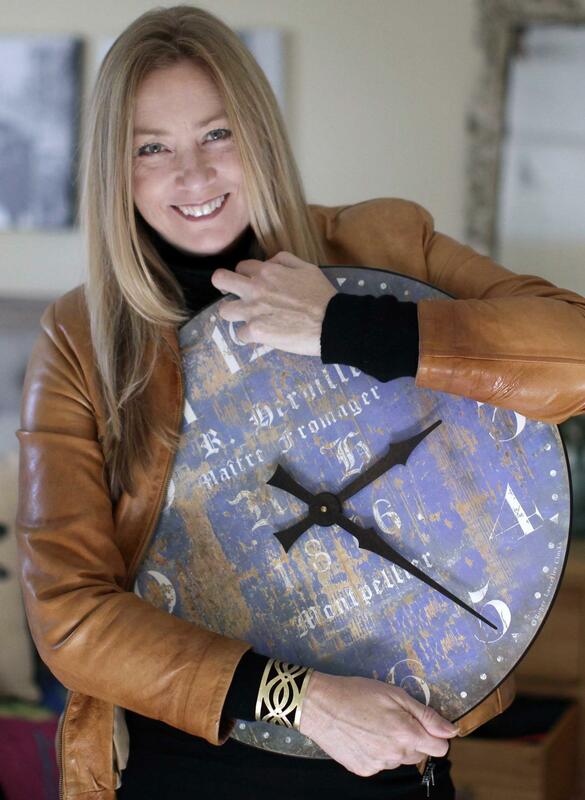 "Merilyn has created the most influential, well-rounded experience I have ever taken part in. 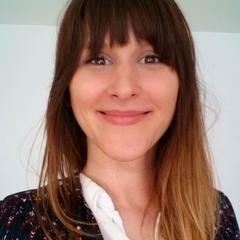 She goes beyond the quintessential productivity tasks and brings emotions, guttural responses, personality and consciousness into the process of curing your productivity sickness. 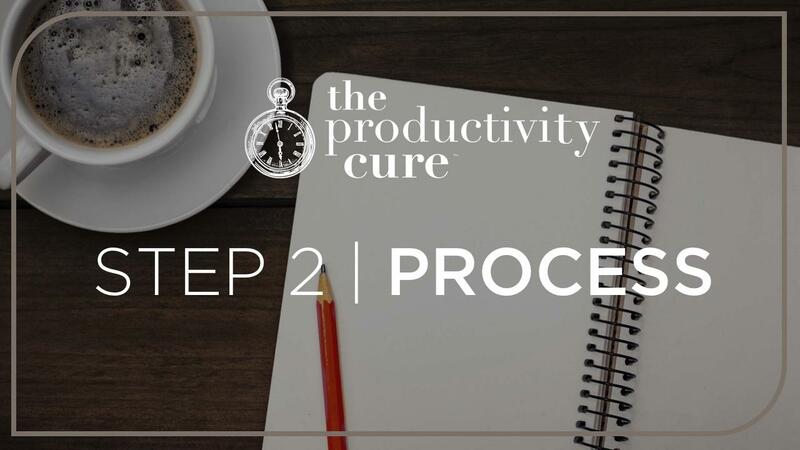 We're all susceptible to catch a productivity 'cold' every now and again, but the lessons you learn through the Productivity cure will not only help you overcome those momentarily lapses, but also set you on the path to ultimate productivity health." 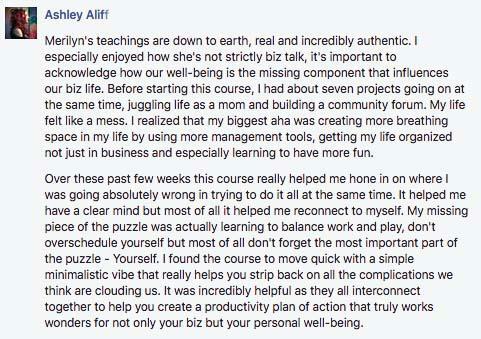 "I've been on countless courses and I can confidently say The Productivity Cure has had the profoundest positive impact on me, not only as a leader of my entrepreneurial world, but also on me as a mother, friend, daughter and all the other countless roles I possess!" 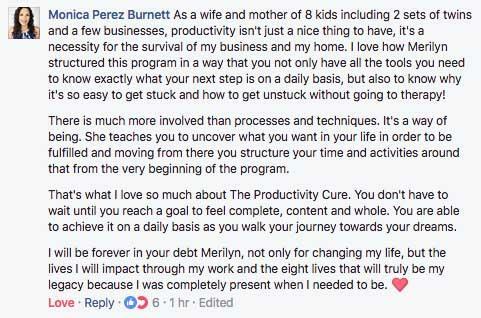 "Merilyn is the type of coach that is full of heart, full of soul, you would want to be around her just to soak up her wisdom and bare-all outlook on life and business"
"Productivity isn’t just a nice thing to have - it’s a necessity for the survival of my business and my home. 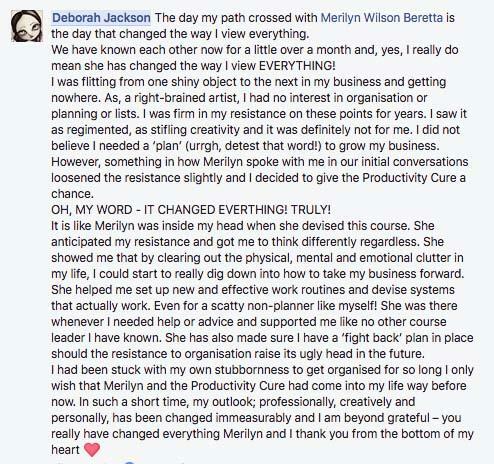 Merilyn’s program is so much more than processes and techniques - it’s a way of being. 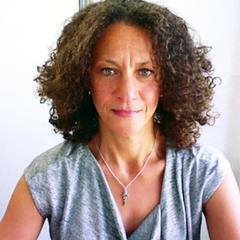 I will be forever in her debt not only for changing my life, but the lives I impact through my work and the eight lives that will truly be my legacy because I was completely present when I needed to be. " "I was hustling big time UNTIL I met Merilyn. I was busy but not getting anywhere. 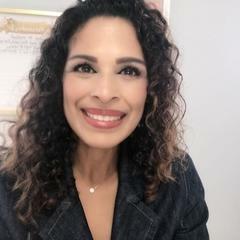 During the program I stopped and re-evaluated everything, went with my gut and did the fastest business re-branding ever, revived my Facebook group and am getting ready to launch my paid program. I got soooo much out of the Productivity Cure and my new way of working gives me so much energy. " 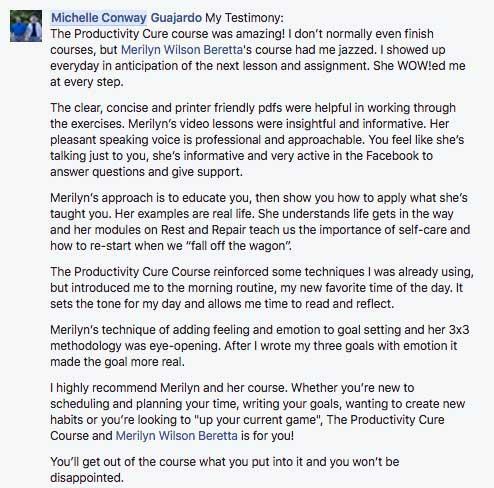 "Merilyn is an amazing teacher and a real expert in her field. After taking the Productivity Cure course I look at productivity from a whole other perspective now. 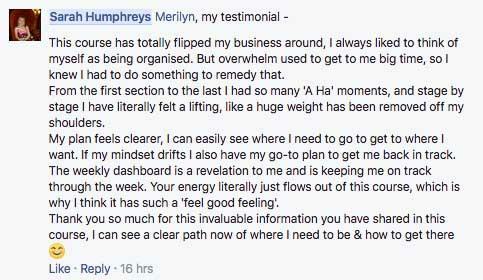 I’ve been able to make changes in my daily life as a result and I’ve made huge progress in my business as well as personal life. I highly recommend the course for anyone struggling with productivity and/or overwhelm. " 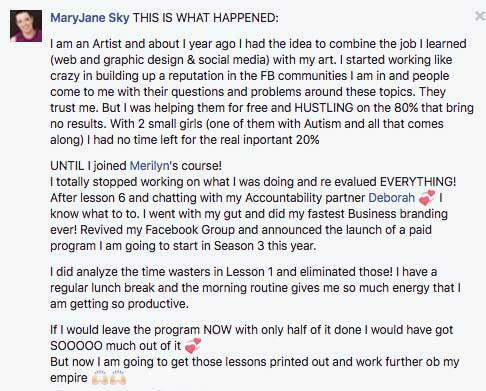 "The course totally flipped my business around! I always liked to think of myself as being organised, but overwhelm used to get me big time, so I knew I had to remedy that. From the first lesson to the last I had so many ‘a-ha’ moments and I literally felt a lifting - like a huge weight has been removed off my shoulders. My plan feels clearer and I can easily see where I need to go to get where I want. 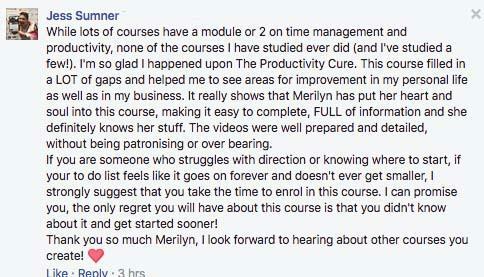 Merilyn’s energy literally just flows out of this course, which is why I think it was such a ‘feel good feeling’. " "This is by far the best business course I’ve taken, and I’ve taken a lot of them. I was constantly stressed because of the overwhelm and disorganization, and was always looking for that miracle technique. Well, this is it for sure. I can assure you it is worth every penny. Merilyn just has a way of motivating you without being over the top. She’s very relatable and encouraging. 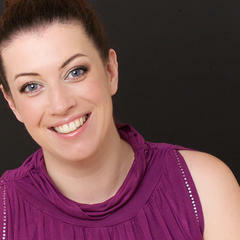 She introduces you to easy and efficient processes that will not only change your business but your entire life. I cannot say enough great things about The Productivity Cure. I highly recommend it to anyone who feels complete overwhelm from the craziness and hard work that comes from owning your own business." 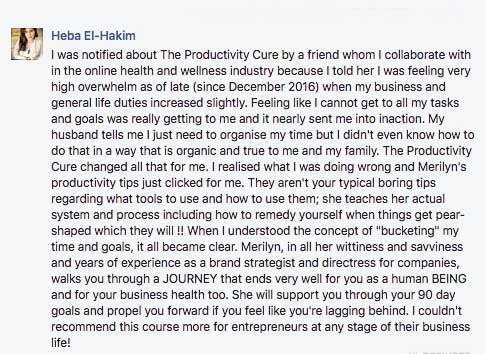 "The Productivity Cure literally saved me. I felt overwhelmed and all over the place. 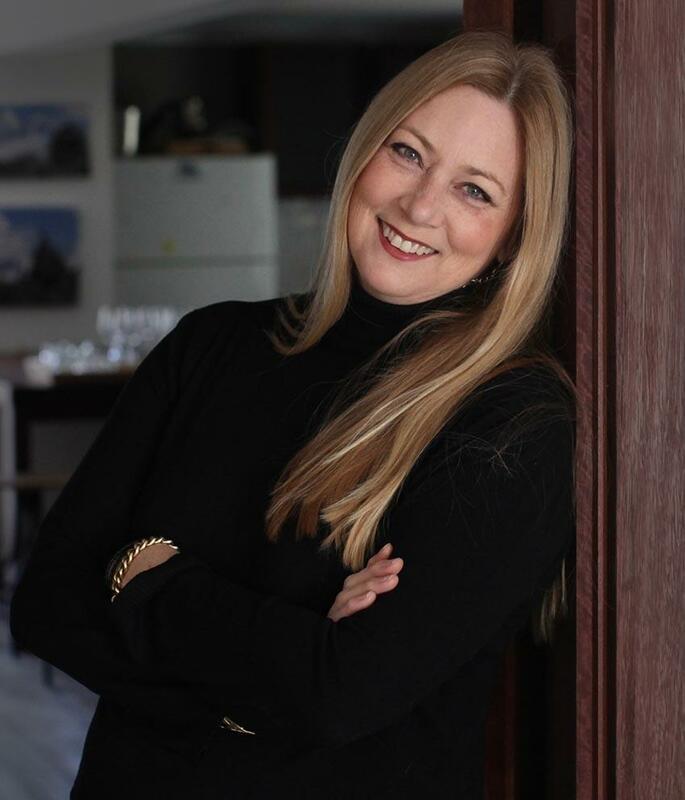 Merilyn lays out such an effective and easy-to-follow system that you can adapt to your own needs in business and life. I love the way each new lesson perfectly builds upon the last one. I was able to implement straight away and create my systems from scratch - this time, the right way! I felt motivated and clear on my next steps, and what’s more important - I still do. Whenever I start to feel a bit lost, I come back to the course lessons and, once again, I get my ducks in a row. 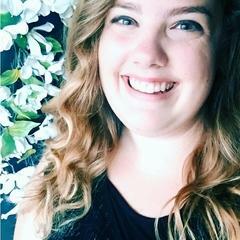 Merilyn is fantastic. You’ll feel more calm, powerful, and productive in both life and business." 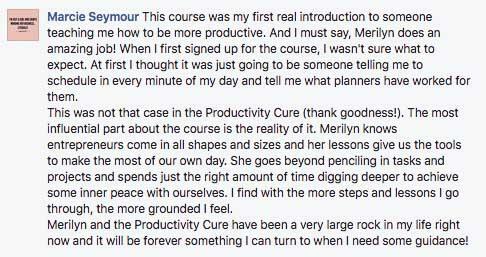 "Before going into this course, I thought I was very productive and that this would be more of a “refresher” course. Oh boy, this course REFRESHED my entire life. It was the medicine I needed to understand what was working in my life and what wasn’t. Do not think any part of your life will not be touched in a powerful way. This course is worth more than it is priced at and has the knowledge you will not find anywhere else. (I promise, I have been looking for this!) Seriously, take the dive and allow it to change your life! 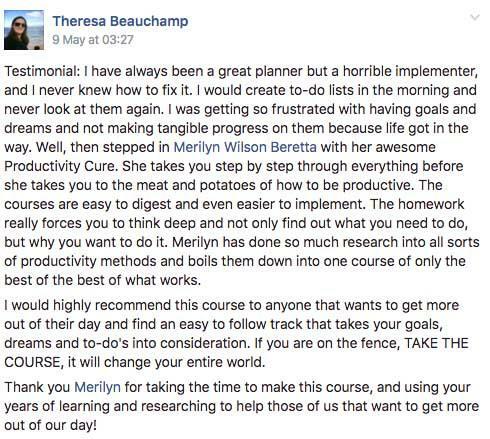 Thank you, Merilyn, for this amazing course. You changed my life in ways you may never know. " 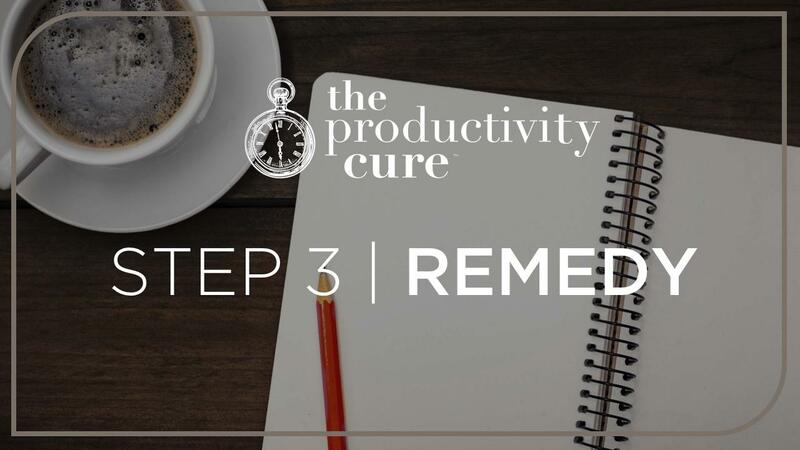 The 3-Step, 30-day, Productivity Cure online programme - holistic productivity, mindsets, business growth, planning, goals, habits, scheduling, decluttering... and much more. Access to me and other entrepreneurs like you, within my inner circle, Private Facebook Community. A 7-part marketing strategy generator. Great for those starting out or wanting to build momentum and find marketing challenging. You'll discover a new (friendly) way to approach marketing. Value $497 FREE. Helps answer the question ‘what do I need to focus on'. A companion guide for starting, growing and scaling your business. Includes: what to focus on first, priority plans, checklists and milestone points. Value $97 FREE. Two practical hours operating as the leader of your business - write your goals, projects and have them all mapped out in a step-by-step plan. 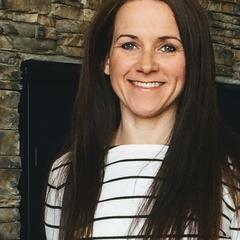 With Q&A to get you unstuck fast plus hot seat coaching. Value $197 FREE. A work and life spring clean! Discover how to navigate change without the usual resistance (& freakout). Create a clutter free head, office and email in-box. Harness the mindsets that have stopped you getting where you want to go. Diagnose exactly what your business and life needs NOW to grow. 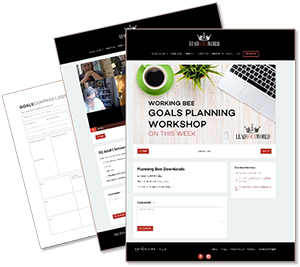 Create a tangible 3 month growth plan for your business. Set up a weekly planning & organisational system that works for your lifestyle. Set you up to achieve results long after you've completed the programme. Create automatic systems that make habits & recurring to-do's a dream. Find out how to properly rest (even with kids running around). Create a go-to emergency plan for business and life aaarrrggggh moments. Start Overwhelmed. Finish with Aaahhh! 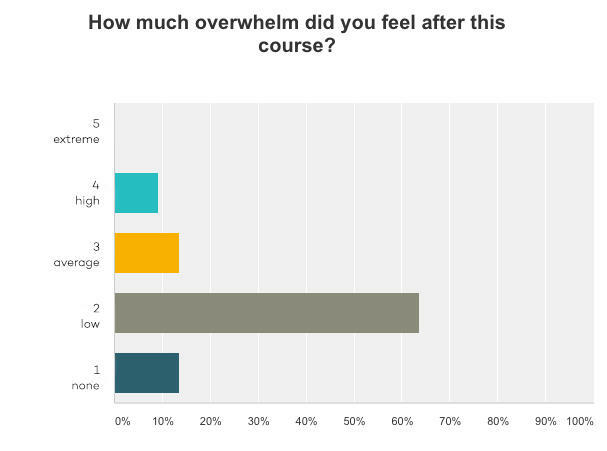 The graph on the left is from a survey taken on day 1 of the course (by 265 pilot testers). This same group was surveyed again after 21 days (right graph). A complete reversal and elimination of overwhelm. Other courses leave you to complete things by yourself. Which is fine if you are already productive with your time! 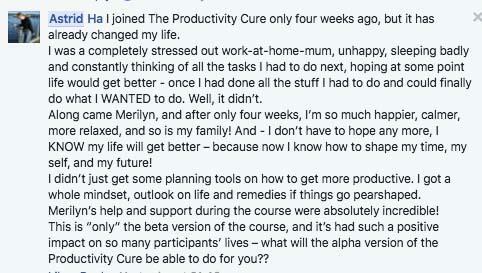 The Productivity Cure (TPC) has regular Live Q&A sessions and a supporting mastermind community in the private Facebook group. Other courses use complex productivity systems and tools that time to use them! Or they require you to spend more money buying their planner or app. TPC - Whilst I adore beautiful planners and apps, I know as a woman running her own business (and parenting) I need the essentials. My system is light but powerful. Other such courses can be too sporty, too corporate, too masculine or too crafty (when planners become more like scrapbooking activities). 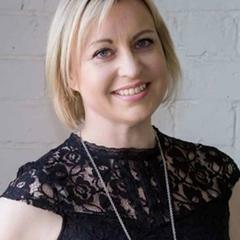 TPC - created by a women who knows what managing hormones, the school run, homework, paying bills, working and building a business on the side. In other courses you might not see the leader of the business interacting in the community on a daily basis, but is delegated to admins or support staff. TPC - you'll be surprised at how much I'm in the group. You can ask questions and I'll be the one to answer them - not an assistant. Other productivity and performance courses and systems can be very left-brained. TPC - a unique left and right brained approach. Intuitive, creative, 'flow' approach, but also logical. 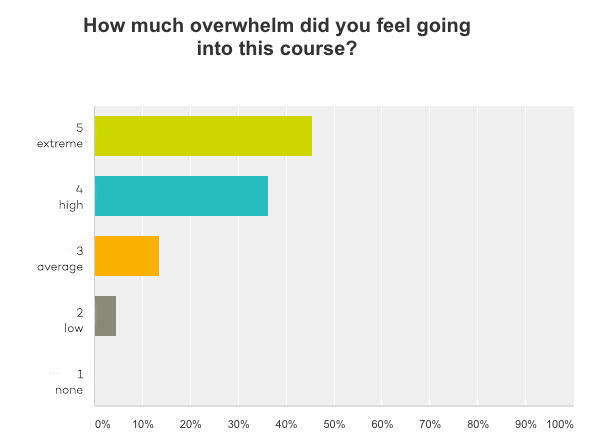 INTERESTING FACT: The industry average for people finishing the online courses they purchase is 3-5%. The Productivity Cure has an incredible 93-97% finishing rate! 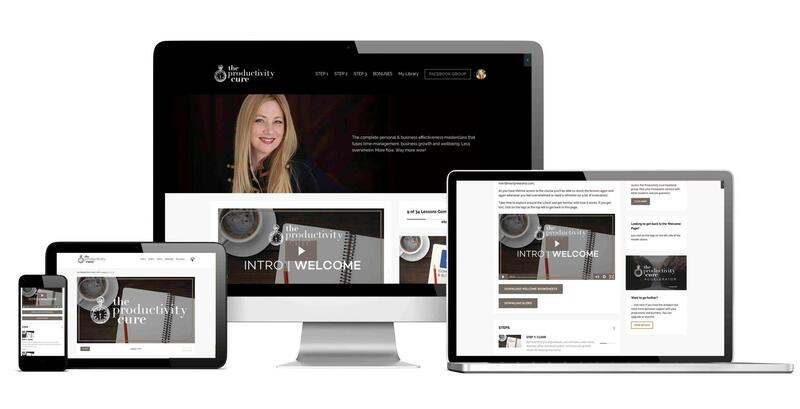 "This course is an overall makeover of one’s life - not just the business. It’s way more than I thought it would be." If you've read this far I know you are still not convinced. That's totally okay. If you don't find your question answered here then email me [email protected] and I'll answer you personally. 1. Will this work for me? Firstly, you ARE special and your business dreams are totally possible (you probably need that affirmation). Secondly, these techniques work in every field and for any age. This method will get you where you want if you do the work. But it can't do your business for you, you'll have to do that. And it can't give you a brain transplant, but you won't need one after this 'cure'. 2. What if I can't stand your Aussie accent after 2 videos? Fair point. Some people find it cute. But when I get excited I can also get loud! Strangely enough previous clients have said they love listening to my recorded voice, which surprised me too. However... if you really can't stand it and then see question 5 below! 3. What if something happens and I can't keep up? Life happens. I get that. You can do this in your own pace. Modules are unlocked over 30 days. 4. Will this help me grow (or start) my biz? 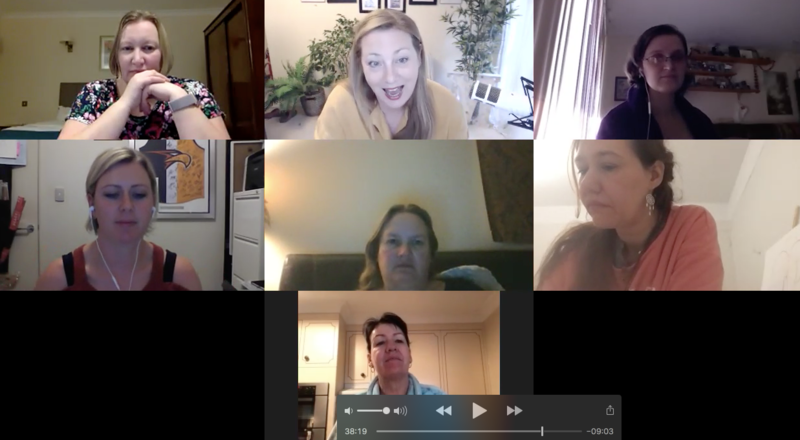 Just by dropping overwhelm, getting clarity and a adopting a productivity system that works, my students have launched, grown and taken existing business in new directions. Other students have started new products in new markets and still others have started courses that are fully booked! Again, refer to Q1 here... it's up to you! 5. What if I need a refund? 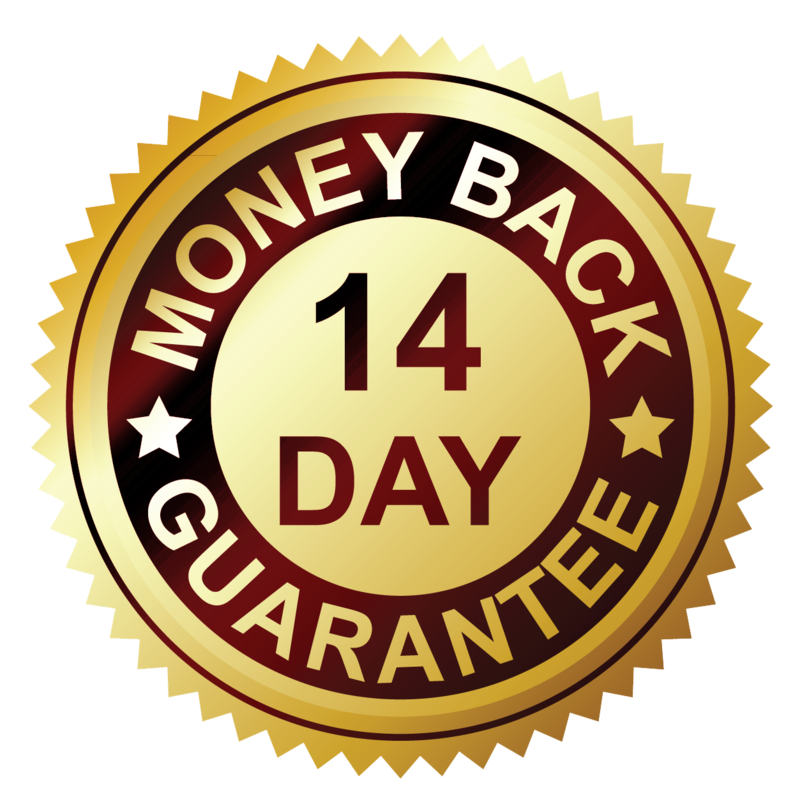 You have a full 14 days to try this and if you still don't think it has reduced your overwhelm and isn't working for you, I will refund every cent. No questions asked.